Handlebar grips Type 366 Black 1960 s Triumph BSA fits 7 8 bars. 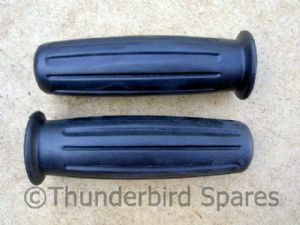 Handlebar grips, Type 366, Black,1960's Triumph, BSA, fits 7/8" bars. This is a pair of new classic bike type 366 handlebar grips, in black, replicas of those made by the famous British carburettor company, they are the distinctive mid to late 1960's grips often seen on export Triumph models (and Norton and BSA too). They will give a nice period touch to bikes from this era. They fit 7/8" bars. (we usually have an 1" bar vesion too).